I don’t know if a blog post is the best venue for this query, but i would love to get feedback from the community. I live on Beacon Ave S, right across the street from the little triangle park at S Stevens near the library. I also live very close to the #36 bus stop. Obviously, where we are situated we get a lot of traffic and noise from passers-by. However, we also get a lot of drunk people who hang out on the benches in the triangle park, sometimes cross the street and sit in the bus shelter and sometimes also migrate to the dentist’s office parking lot. We get a lot of yelling, screaming, singing, smashing bottles, foul language, and even public urination (against the tree in the triangle park or against the hedges in the parking lot). We have a family with little kids that lives downstairs and they often play on their toy bikes in front of the house. It’s hard to know what to do. Does anyone deal with this? Any suggestions? The BHB headquarters is very near Stevens Place, and we have noticed the same occurrences, including public urination, confrontational behavior with neighbors in the park, and activity that looks very much like drug transactions; this has been the status quo at this park for a while now. What are your thoughts on the matter? Sunbathing, sleeping, or worse? 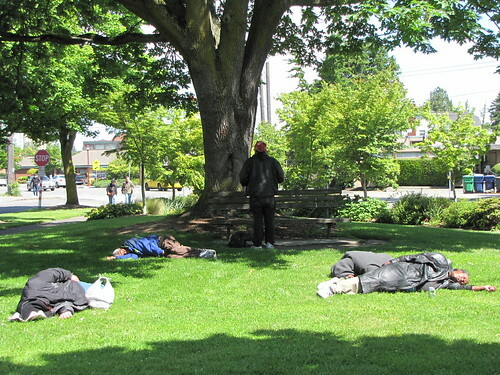 One Saturday this summer, four men were sleeping on the grass in Stevens Park. Aid cars arrived slightly later to attend to one of these men. We don't know about the men in this particular picture, but often the sleepers in the park are intoxicated or worse. Aid car and police visits to the park have been very frequent this summer. Photo by Jason. 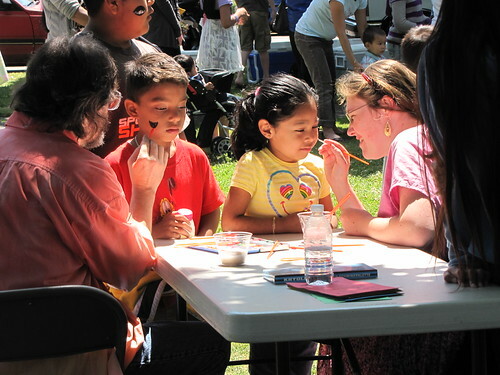 There was much fun to be had at yesterday’s Piñata Party at Stevens Place Park, including music, dance, and martial arts performances, donut fishing and face painting for the kids, tasty potluck food, and of course, the piñatas. Here are some views of the festivities, and a couple of videos, too. Donut fishing. Photo by Jason. And a time-lapse video of the whole day’s festivities. Can you find yourself? 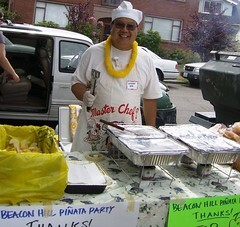 Warren Yee was a master chef at the 2007 Piñata Party. Photo by Moxie G in the Beacon Hill Blog photo pool on Flickr. It’s almost time for the annual Piñata Party at Stevens Place Park (informally known as Triangle Park—it’s the small triangular park located between Beacon Avenue South, South Stevens Street, and 17th Avenue South)! 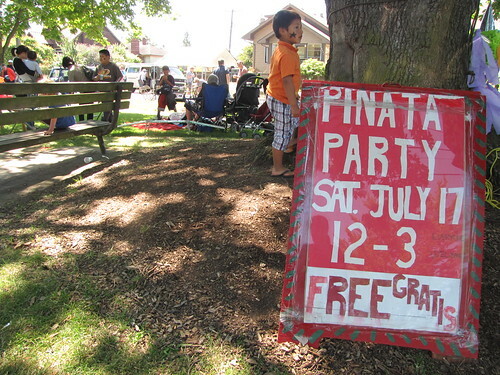 Last year’s party was cancelled because of the Link Light Rail opening day festivities, but this year it’s back on July 17 with music, food, and as always, piñatas for the kids to clobber. 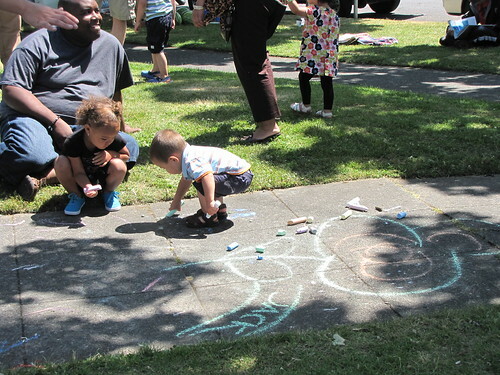 Our neighborhood Beacon Hill Piñata Party is Saturday, July 17 from 12 noon – 3:00pm at Triangle Park at South Stevens Streeet and Beacon Avenue South. 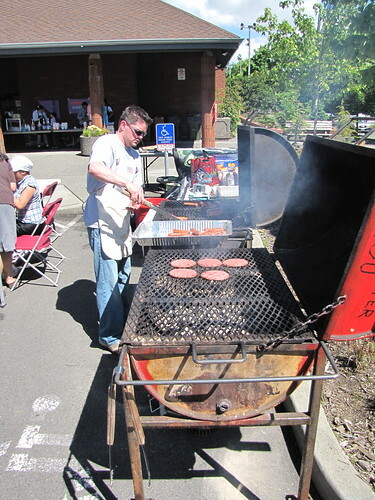 We’re not grilling this year. 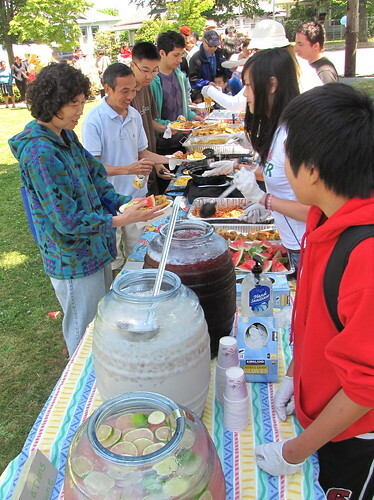 Instead, food will be potluck style with a few local restaurants and Red Apple contributing. We’ll definitely have free fruit, juice and water. Please bring an item to share or a picnic lunch. 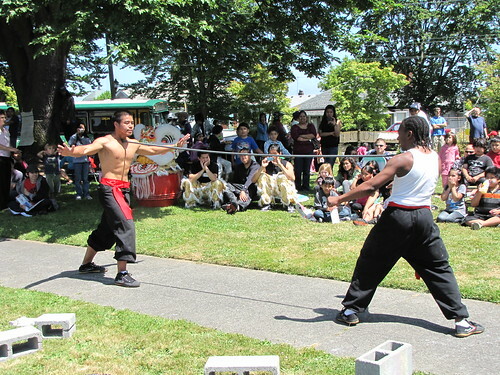 Local band and Piñata Party tradition Lushy will perform as well as Beacon Avenue’s Jun Hong Kung Fu and a Oaxacan dance for kids. 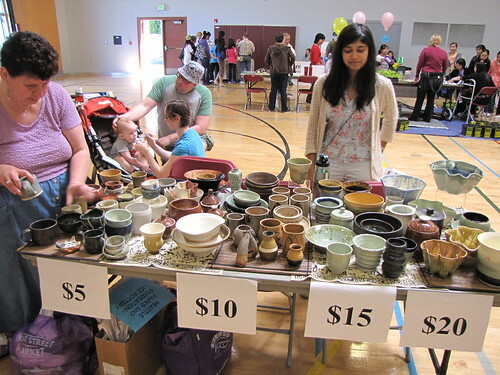 There will be a number of fun games for kids, too. Piñatas will start around 2:15pm. We still need a few more piñatas. Please let me know if you can bring a piñata. Here’s a flyer you can download and circulate—all are welcome! Please let me know if you have any questions… see you there. PS. Here are some photos from the 2008 Piñata Party. 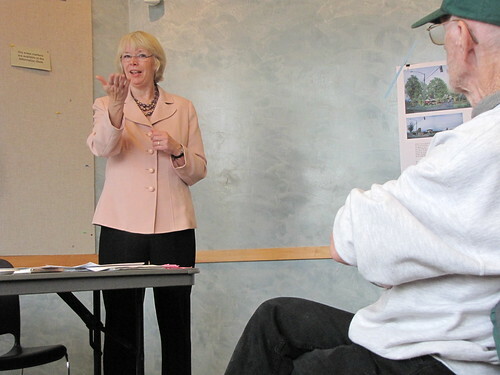 In the last few days on the hill, some people worked on neighborhood issues, and some had fun at the Beacon Hill Festival, while only a few blocks away, others slept in the park. Photos in this post are by Jason unless otherwise noted. 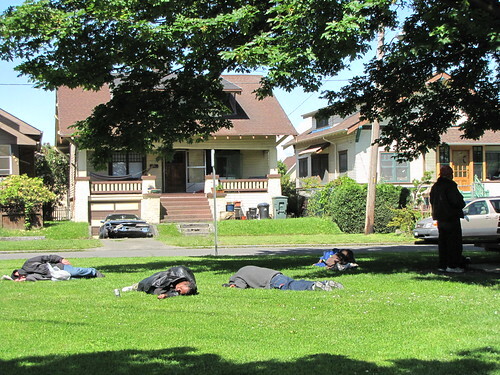 ...and sleeping on the grass in Stevens Place (Triangle) Park. 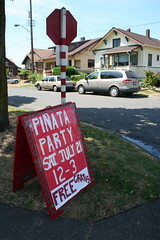 This sign advertised the 2007 Piñata Party in Stevens Place Park. Sadly, there won't be a party this year. Photo by Laura Hadden. 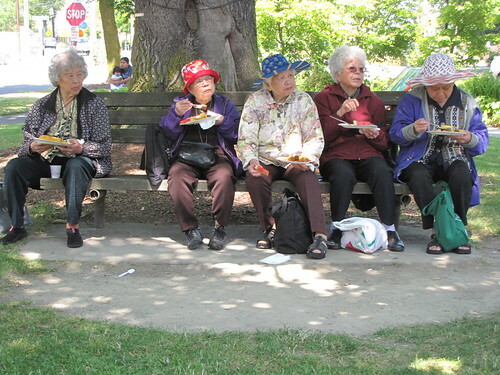 We’ve decided to skip the annual Piñata Party in Triangle Park (Stevens and Beacon) this year. We had originally planned the event for July 18th. Now that’s Link Light Rail’s first day. After thinking about it, we decided to take this year off and come back with a great party in 2010. The tentative date we set is Saturday, July 10, 2010. If you want to help organize the 2010 Piñata Party, let me know and we’ll connect closer to the event. 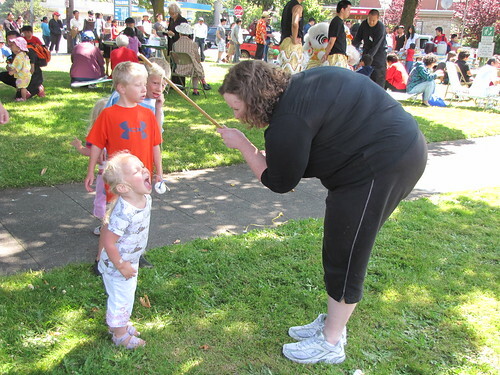 Though there won’t be a Piñata Party that day, Sound Transit promises that “stations from Westlake to Tukwila will include a Welcome Portal and family-friendly entertainment.” Train rides will also be free. So visiting the Beacon Hill light rail station and riding to the other stations should be a fun alternative, though — as far as we know — there won’t be any piñatas there. Water leaking next to Stevens Place Park running north on 17th Avenue South. Photo by Wendi. I’m drafting a post about walking the stairs around Beacon Hill for fun and fitness (okay…not really that fun). That was yesterday’s walk–a little much for an old dog on a hot day. 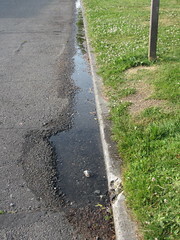 Today’s walk was a slow stroll around the west side of Beacon Ave. As we often do, we looped around Triangle Park (Stevens Place) for a drink from the fresh, cool water running out into the gutter. Tica appreciates the drink and the chance to splash/pad around in the water. I’m a bit worried about the waste. 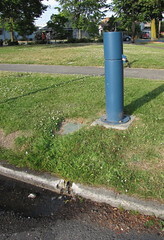 The water runs out from a pipe on the curb underneath this blue pillar. Often birds use the resulting puddle as a birdbath. Photo by Wendi. Has anyone else noticed this? There’s either a broken water main or some other problem, because I don’t think the City intentionally pumps large amounts of fresh water into the storm drains on a regular basis. This water has been flowing for at least 2 years. I keep forgetting to call it in and can’t find a way to email it in while it’s fresh in my mind. Maybe if several of us call? 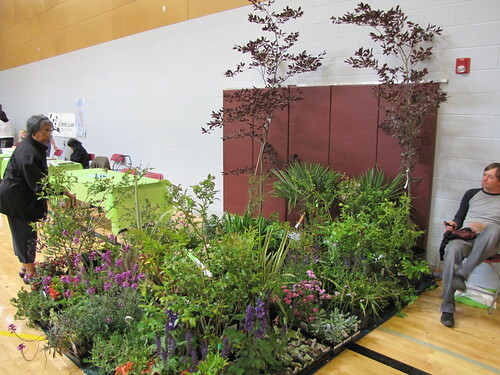 Or if someone reading this works for Parks & Rec and/or Seattle Public Utilities? The water flows out directly underneath the locked blue box on the SW corner of Triangle Park. Take advantage of the cooler weather and go out for a walk! Remember when this was typical winter weather? Photo by Joel Lee, from the Beacon Hill Blog photo pool. Not so much this year, it seems, as we await yet another potential powdering of snow. 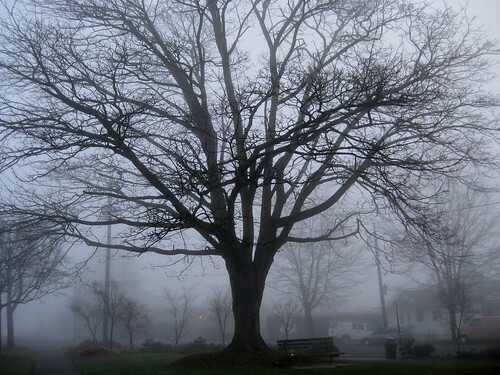 But we have had some typical misty Seattle winter days, and Joel Lee caught this gorgeous view of the tree in Stevens Place Park on a recent one, then posted it to the Beacon Hill Blog photo pool on Flickr. Thanks, Joel!